Dreaming about starting piano lessons for adults? Here you'll get tips, tools, and lots of encouragement to guide you to finally realizing that dream of yours. What are you waiting for? Let’s get started! Learning to play piano as an adult can be a wonderful journey of finally realizing a perhaps lifelong passion. And the best of all, contrary to what some believe, starting piano lessons is never too late! Piano lessons for adults even have several other benefits and advantages, but more importantly; you are doing it because you have chosen to, not because someone told you to. Realizing this dream starts with some basic tools. First, you will need a piano and some equipment like a comfortable piano bench, great lighting and perhaps a metronome. What kind of instrument do you need? Read my tips on how to find your ideal piano here. You will also need to get the right beginner piano book; a beginner piano method directed to adults. Methods for children are not ideal since the learning curve, pace and understanding is completely different for an adult than for a child (one of the advantages!). So, make sure to get a quality method which is intended for later or adult beginners. No method is complete without supplementing sheet music. It may be easier to get the supplementary books in the same series as the method you choose, but I recommend selecting other piano books and sheet music as well. Why not just stick to one book or piano method? It’s important to get used to different types of layout and size of music notation. It’s also important to be flexible, and not getting stuck with or dependent on only one approach to reading music or piano learning style. This you can do by exploring a variation of different sheet music and styles. Probably the teacher will recommend you what books to get, but because it might take a while to find a teacher and get lesson times set up, here are some recommendations to get started. There are computer programs available that make learning the notes and note reading easier. 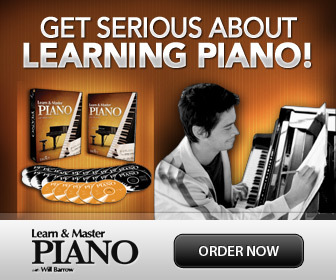 I have some recommendations of great piano learning software here. Teach Yourself or Find a Piano Teacher? You need to decide whether you should take lessons from a piano teacher, preferably specializing in adult beginners, or if you should teach yourself to play. Even if you teach yourself, I still recommend finding a piano teacher who has experience teaching adults and taking at least a few piano lessons, just to avoid developing any bad habits pianistically. How do I find a teacher good with adult beginners? Is it appropriate to interview them or ask for a CV? What do I look for? What questions should I ask? If you feel nervous about finding and how to approach a piano teacher, read my tips here. If regular piano lessons for adults are not an option, or difficult to find where you live, you could sign up for online piano lessons for adults like these, with a real teacher and personal feedback. It’s practical and is available in your home no matter where you live! You can also start with my free basic piano lessons here. Organizing your practice sessions is easier in the beginning when new habits are formed. Make sure to set up a practice routine that you can keep, both for practice and just to enjoy music, as soon as possible. Here are more helpful tips. Staying motivated is key! It can be a good motivator to join an online forum for adult pianists to get «virtual» pals and ask for feedback, get ideas and encouragement by other adult beginners. You can get tons of inspiration and tips by checking out videos of amateur and professional pianists on for example YouTube. Set up goals. Always striving for new goals will keep you motivated. You could also consider signing up for an exam system like RCM, which now has a program for adults. Taking exams, or just following the repertoire requirements, can be a helpful way to measure your own progress. How high can you aim as an adult beginner? That’s up to you and how hard you work. 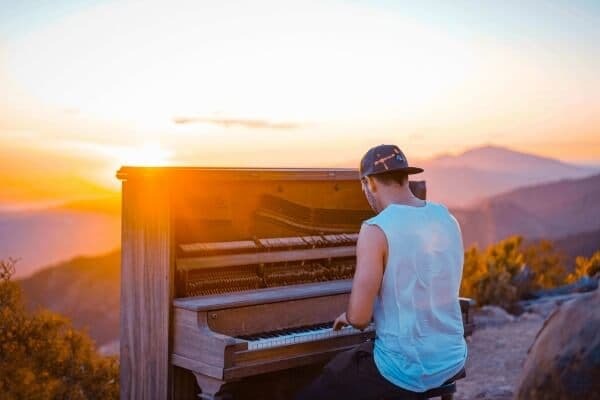 Realistically, starting late in life with piano lessons for adults will not make it possible to launch a famous career as a solo concert pianist, but you can certainly go as far as your passion takes you! If you played piano as a child and now want to start again, chances are that not all is forgotten. Since a lot of skills are stored in the "motor memory", like bicycling it's something that's never really lost, (although it could be rather "rusty"). Depending on the level you played at when you quit- there's no saying how far you can take it with piano lessons for adults- this time! Finally, where you’ll take your piano playing is your own personal journey. Even if you only want to amuse yourself and have fun, the great thing with the piano is that you can sound amazing even with the easiest little pieces. As long as you listen, play with expression and yes- passion!